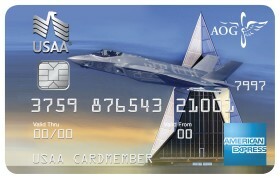 USAA has teamed with AOG (Academy of Graduates of United States Air Force Academy) to offer a Military Afiliate American Express Card available only to AOG graduates. The card features special introductory offers plus the outstanding customer service of USAA and benefits of an American ExpressCard. 2,500 bonus points with your first purchase. For details and application visit the main USAA Credit Cards page and select the “Military Affiliates” tab.